Does fitness have to be an all or nothing proposition? Experts say no. Simply walking can have cardiovascular benefits. And you can walk a lot longer in your life than you may be able to run or kick box. Some take walking to the woods or hills and call it hiking. Others take walking to the streets for an “urban hike.” As a child, I walked everywhere my feet could take me–and my mother allowed! I could explore, see much more of my world, stop and smell the roses. As an adult I enjoy hiking in nature and walking around the city of Chicago. I see things I often miss when I am driving or biking. A good long walk clears my head, literally pumping fresh oxygen (via my blood) to my brain. 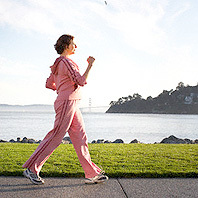 According to Wendy Bumgardner, at About.com, a study in the Nov. 14, 2005 issue of the “Archives of Internal Medicine” confirms that walking builds aerobic fitness at both moderate and high intensity. Improvements in aerobic fitness were seen in the study group for those who walked with high intensity, either with low frequency or high frequency. But similar benefits for aerobic fitness were also seen for those walking at moderate intensity and high frequency. “The findings demonstrate that significant improvements in cardiorespiratory fitness can be achieved and maintained over 24 months via exercise counseling with a prescription for walking 30 minutes per day, either at a moderate intensity five to seven days per week, or at a hard intensity three to four days per week,” Glen E. Duncan, Ph.D., R.C.E.P.S.M., of the University of Washington, Seattle, and colleagues concluded. Moderate Intensity Walking: Walking at 45-55% of maximum heart rate, an intensity at which you may be breathing a little harder than usual but able to keep up a full conversation. High Intensity Walking: Walking at 65-75% of maximum heart rate. You are able to speak only in short sentences. Low Frequency Walking: 3-4 times a week for 30 minutes a session. High Frequency Walking: 5-7 times a week for 30 minutes a session. High Intensity, Low Frequency: 30 minutes per day 3-4 days per week at 65-75% maximum heart rate. Moderate Intensity, High Frequency: 30 minutes per day 5-7 days per week at 45-55% maximum heart rate. Read entire article at About.com here. How Do I Find My Target Heart Rate? It’s easy! Use these simple online calculators. Target Heart Rate Calculator from MayoClinic here. Target Heart Rate Calculator based on your fitness level from About.com here. Target Heart Rate Calculator for different intensity levels from Fitwatch.com here. Or follow the instructions below from WikiHow.com to calculate your target heart rate the old fashioned pen and pencil way! What’s this Karvonen Method of Calculating Target Heart Rate? Find your resting heart rate as soon as you wake up. You can do this by counting your pulse for one minute while still in bed. You may average your heart rate over three mornings to obtain your average resting heart rate (RHR). Add the three readings together, and divide that number by three to get the RHR. For example,(76 + 80 + 78) / 3= 78. Find your maximum heart rate and heart rate reserve. Subtract your age from 220. This is your maximum heart rate (HRmax). For example, the HRmax for a 24-year-old would be220 – 24 = 196. Calculate the lower limit of your THR. Figure 60% of the HRmaxRESERVE (multiply by 0.6) and add your RHR to the answer. For example,(118 * 0.6) + 78 = 149. Calculate the upper limit of your THR. Figure 80% of the HRmaxRESERVE (multiply by 0.8) and add your RHR to the answer. For example,(118 * 0.8) + 78 = 172. Combine the values obtained in steps 3 and 4 and divide by the number 2. For example,(149 + 172) / 2 = 161 (You can get the same result by simply multiplying HRmaxRESERVE by 0.7 and adding to it RHR). When you take your reading for your resting heart rate, make sure to do so the morning after a day where you are rested, as trying to do this after a day of a hard workout can affect your results. You should ensure during your workout that your heart rate falls within your target heart rate zone to maximize cardiovascular fitness. A rule-of-thumb is that if you’re able to sing, you’re not working out hard enough. Conversely, if you’re not able to talk, you’re working out too hard. One of the most common ways to take a pulse is to lightly touch the artery on the thumb-side of the wrist, using your index and middle fingers. This is called a radial pulse check. You may also place two fingers below the jawline, along the trachea (windpipe) to feel for a pulse, again using your index and middle fingers. This is called a carotid pulse check. When taking your pulse for ten seconds during a workout, stop exercising. Do not allow yourself to rest before taking your pulse, and immediately resume exercise after the ten seconds. Multiply by 6 and you’ll have your heart rate. If you are serious about working out and becoming more cardiovascularly fit, you may want to consider purchasing a heart monitor for accurate readings during your workout sessions.